Fresh off the ocean we returned to the mainland of Ecuador and decided some more mountains were in order. 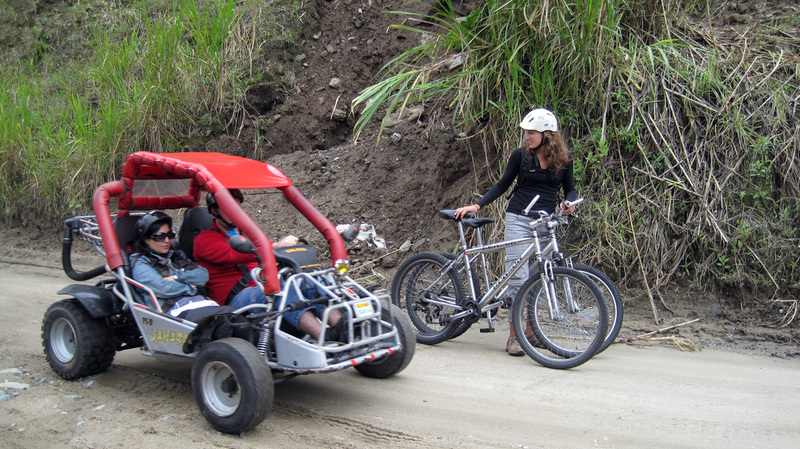 Our first stop was the touristy town of Banos at the base of the active volcano Tungurahua. We spent almost a week there hiking, biking and enjoying some great restaurants. 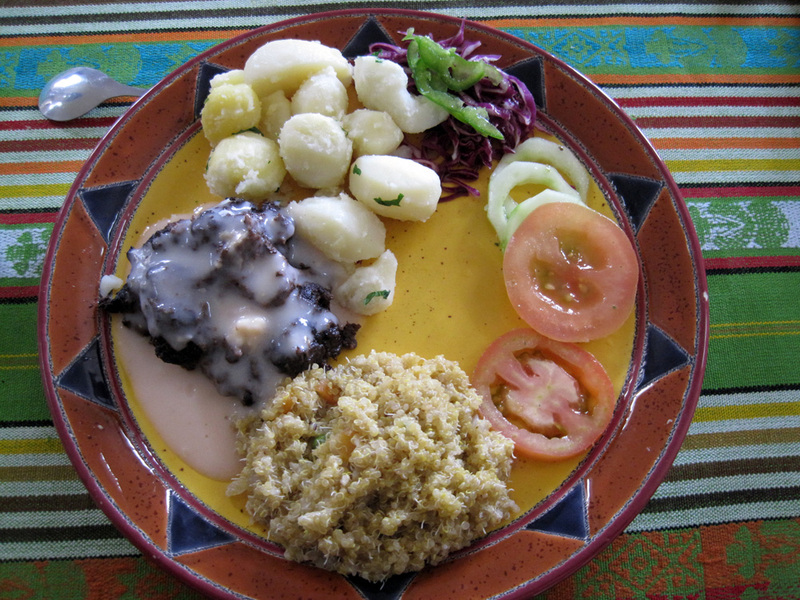 Yes, good food can be found in Ecuador! The weather didn’t always cooperate but we did get out to the “Avenue of Waterfalls” which is a nice cliff side road leading down to Devil Falls. We rented bikes for the day and had a great time. 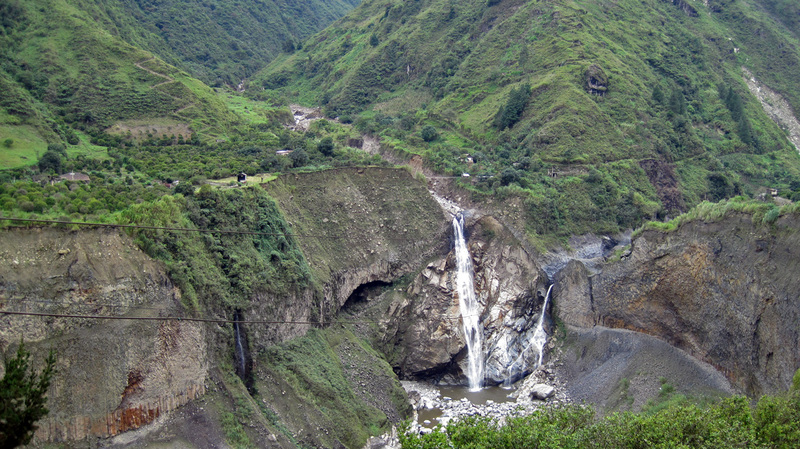 Waterfall number one on the ride from Banos to Devil Falls. Caroline has internal combustion envy. 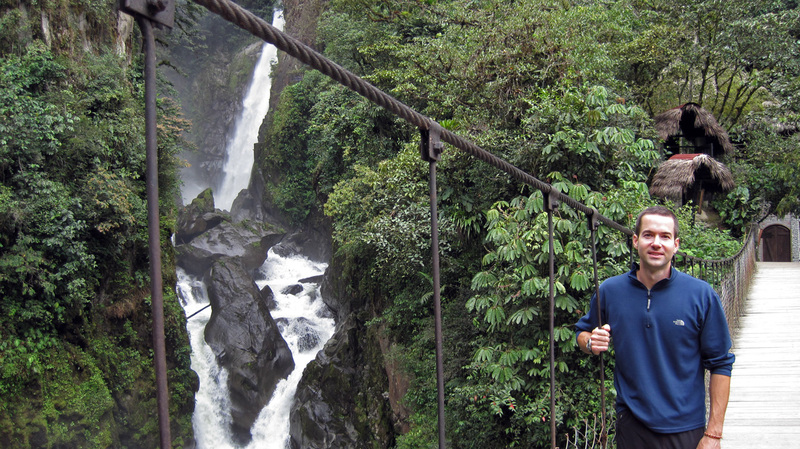 After the short hike down to Devil Falls we crossed the bridge and climbed up behind the waterfall. 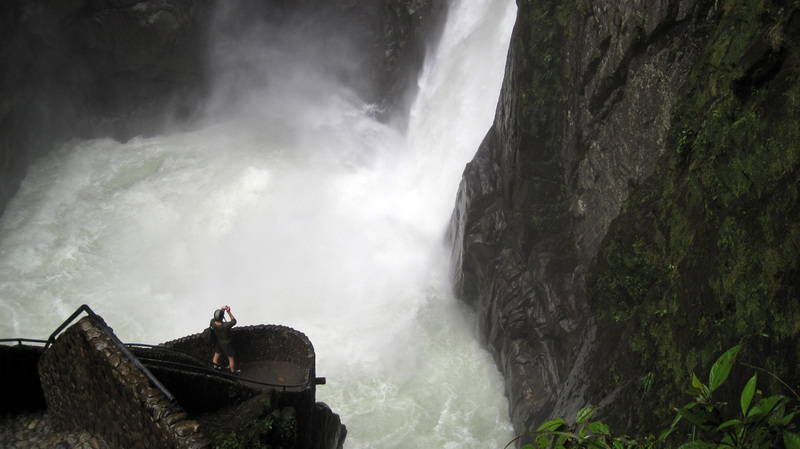 The falls were really powerful and there was a great path that brought us right behind it. We got soaked, didn't bring the camera back there, sorry. From Banos we hit the road again and headed south to Riobamba, which is the city at the base of Ecuador’s highest volcano Chimborazo. 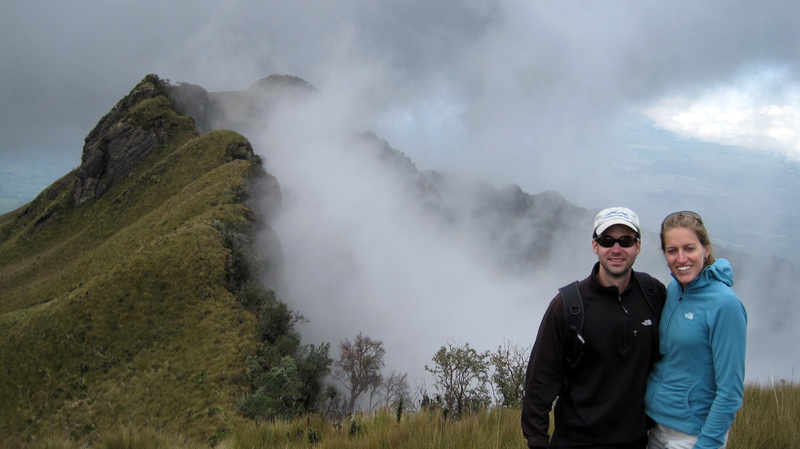 Actually, we found there was not much else to do in Riobamba besides visit the volcano. So we took a tour which let us hike up to the refuge at 16000ft and then we mountain biked down from the parking lot to the next town below. It was lots of fun and we finished the day with a Llama steak feast! 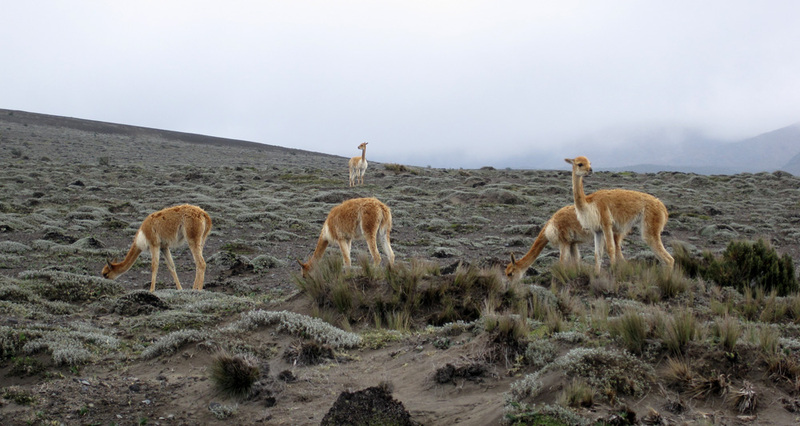 Wild Lamas, called vicuña, that live above 13,000ft on Chimborazo. 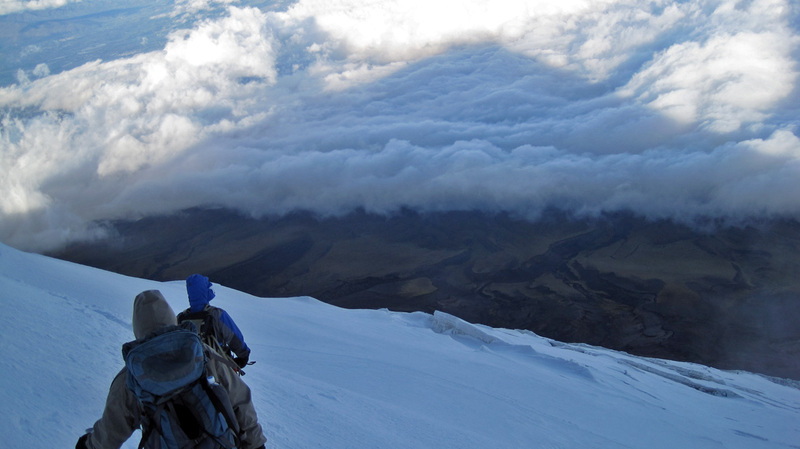 Caro wins the race down from Volcano Chimborazo. Llama steak and quinois was on time. Continuing our southern run we bused it down from Riobamba all the way south to Cuenca, Ecuador’s third largest city. While Cuenca is charming and colonial, it is still just a city, and we are getting a little tired of cities. So after two days of visiting we decided to head back to a place that we fell in love with before: The Secret Garden – Cotopaxi. As you might recall we visited the Secret Garden when we first arrived in Ecuador, before the going out to the Galapagos. 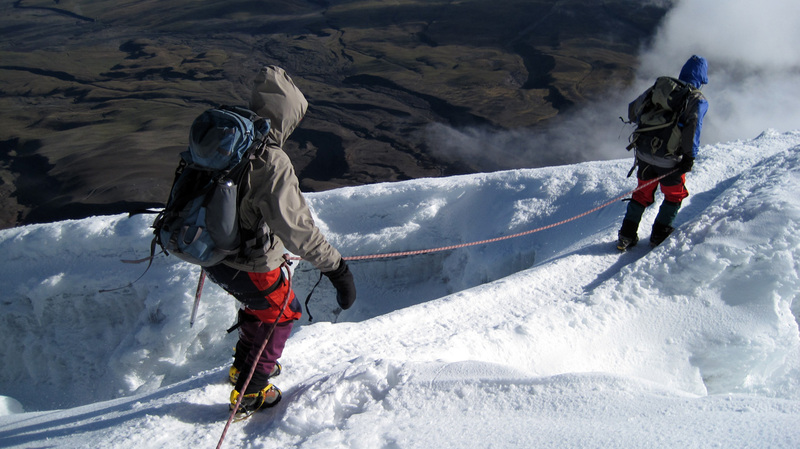 At that time there was some discussion of climbing Cotopaxi but we opted to just do a short day hike up to the glacier and refugio. This time however, we had a little more time and got more serious about it. 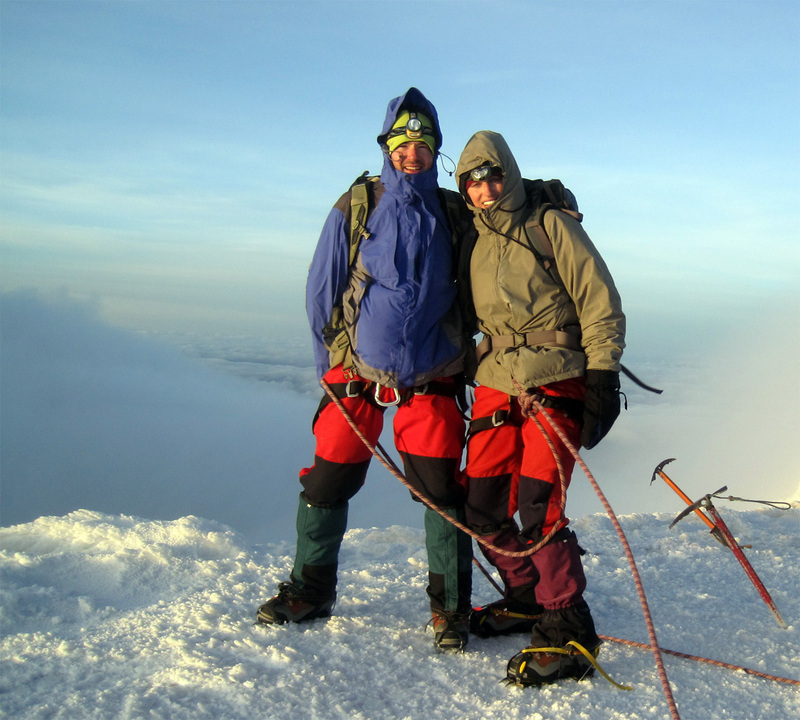 After talking to a few folks that had done it recently and recruiting another climber, Jake (a volunteer at the lodge), we booked our guide and decided to have a go at the summit! 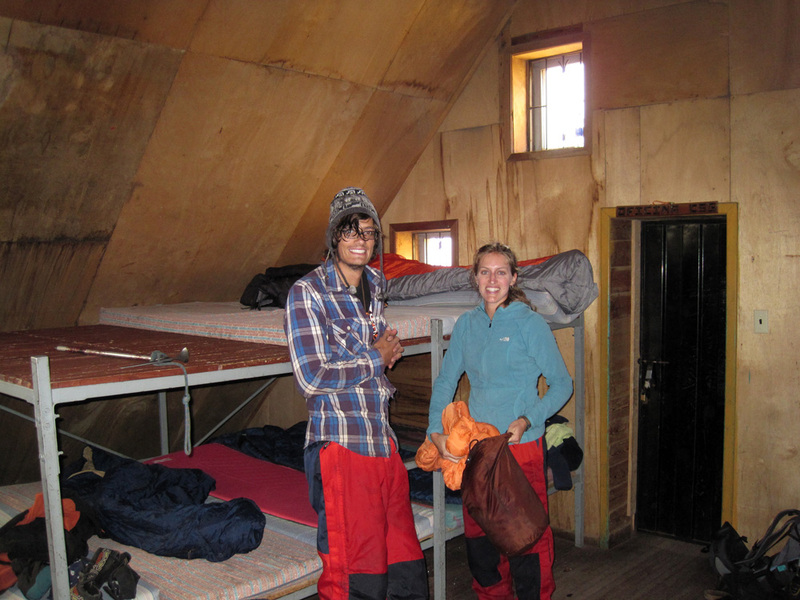 We had three days and nights to prepare at the lodge, which was great for acclimatizing because it’s up at 11,500ft. To help prepare us even more and to increase our red blood cell count, we hiked up the ‘hill’ behind the property called Pasochoa (~13,800ft). Jake led the hike and we all made it up in a good time, which made us feel pretty good about our chances on Cotopaxi. Back for more? 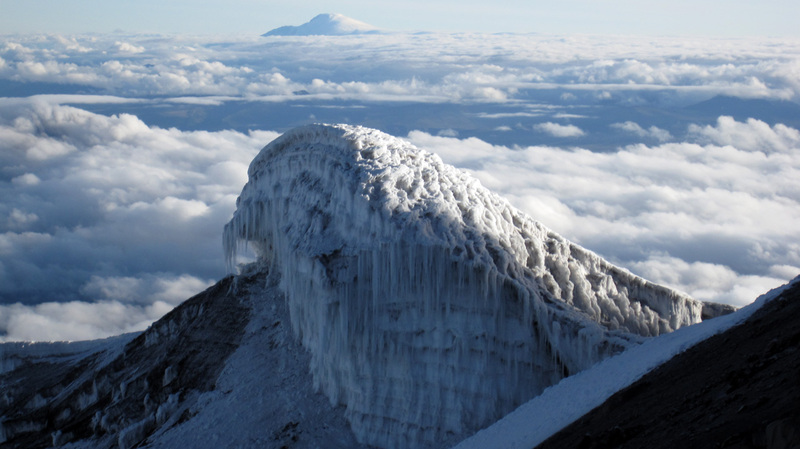 Cotopaxi seen from the slopes of Pasochoa. 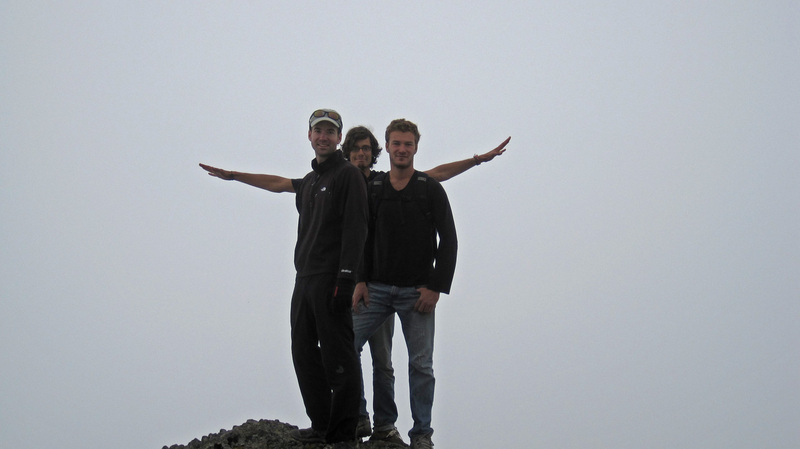 Pat, Jake, and Hayden on the summit of nearby Pasochoa. 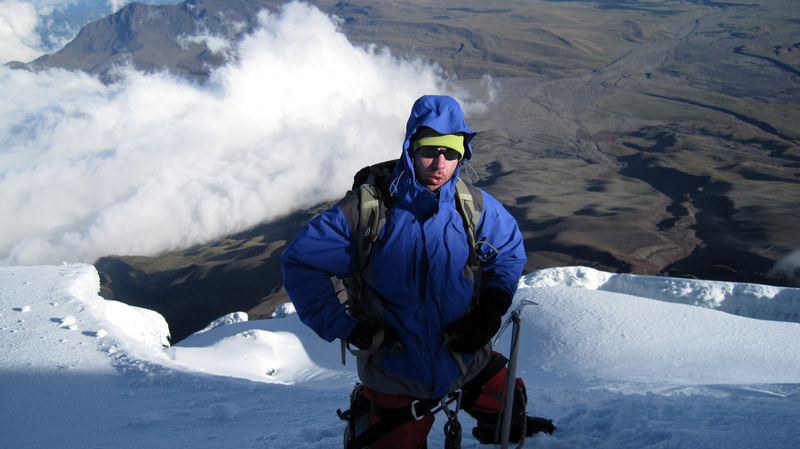 Feeling good around fourteen thousand feet on Pasochoa, part of our acclimatization routine. 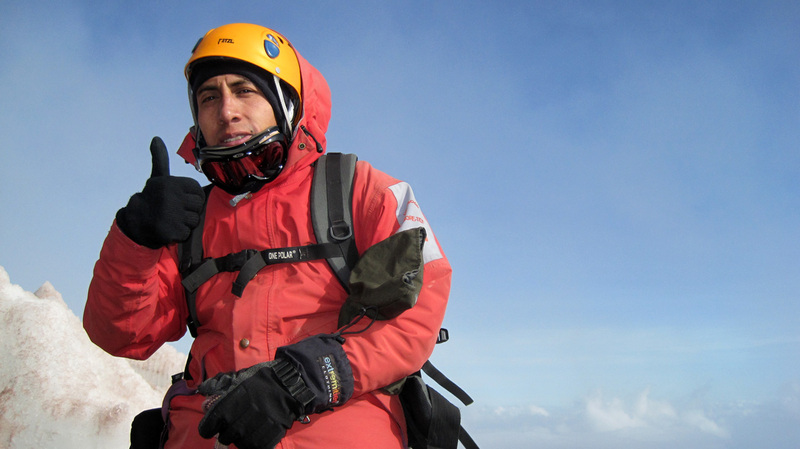 On February 17th we met our guides Marco and Gustavo and got lots of warm layers of fleece, waterproof parkas, pants, mountaineering boots and crampons. 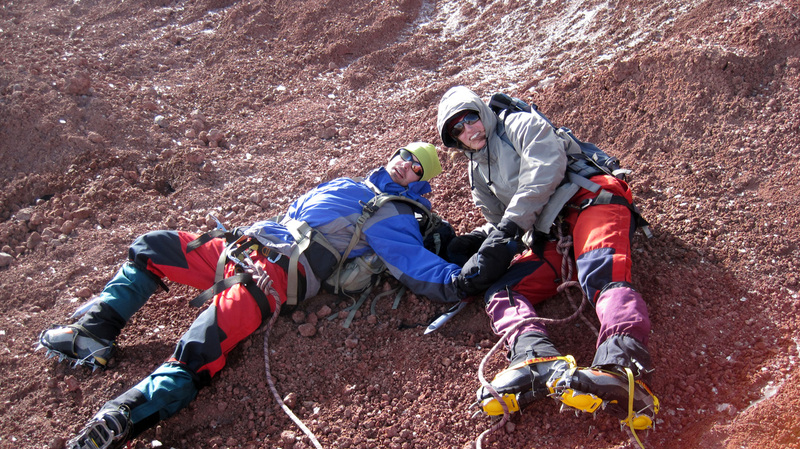 This was Caroline’s first mountaineering experience and she was a little nervous but very excited (or was it: very nervous and a little excited?). 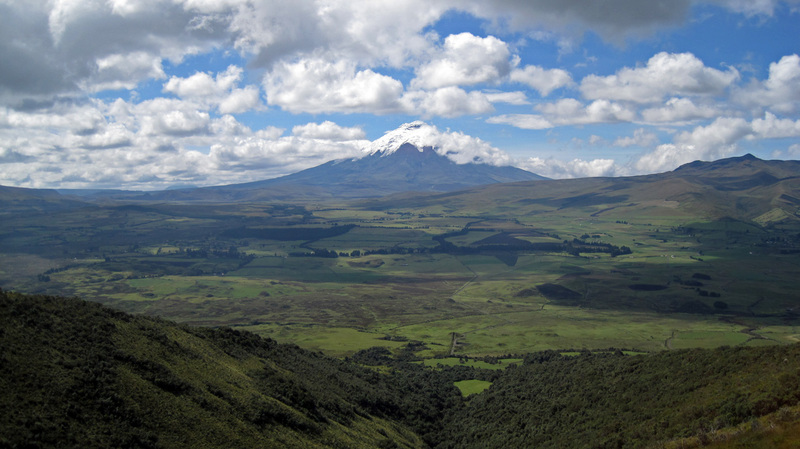 So we all hopped in a land cruiser with the guides for the ride up to Cotopaxi’s parking lot. 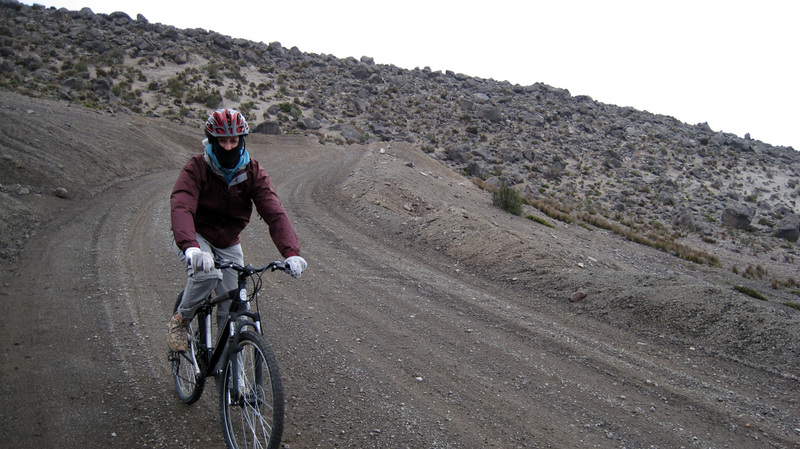 From there we slogged up the steep slope for an hour to the mountain refuge, or refugio, at ~15,500ft. We rested there and had a quick lunch followed shortly there after by dinner, then went upstairs to try to sleep until midnight. 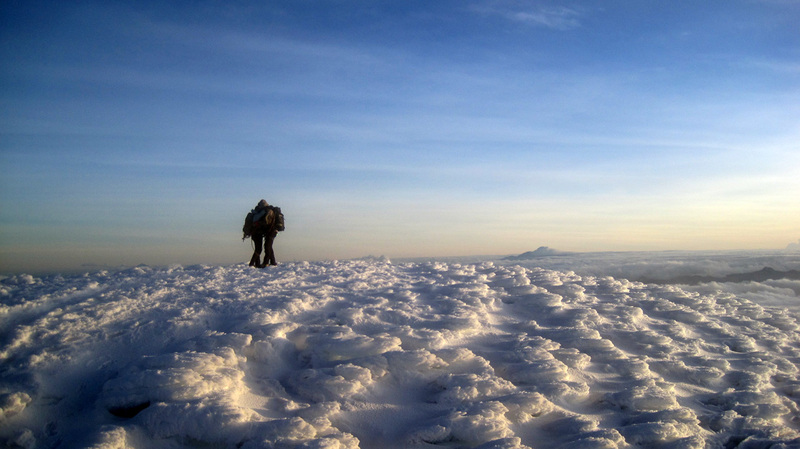 Almost everyone who climbs Cotopaxi starts from the refugio around one in the morning to try to get up to the summit by sunrise. This is done for a couple of reasons, most importantly because the snow and ice of the glacier is at its most stable when it’s frozen. 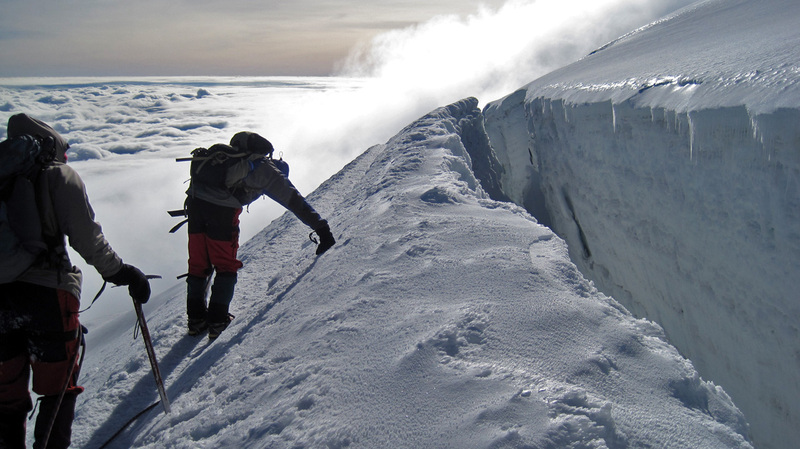 Once the sun comes up it warms and softens the snow, there are a couple of snow bridges over crevasses that must be crossed on the route and that would be very dangerous during the day. 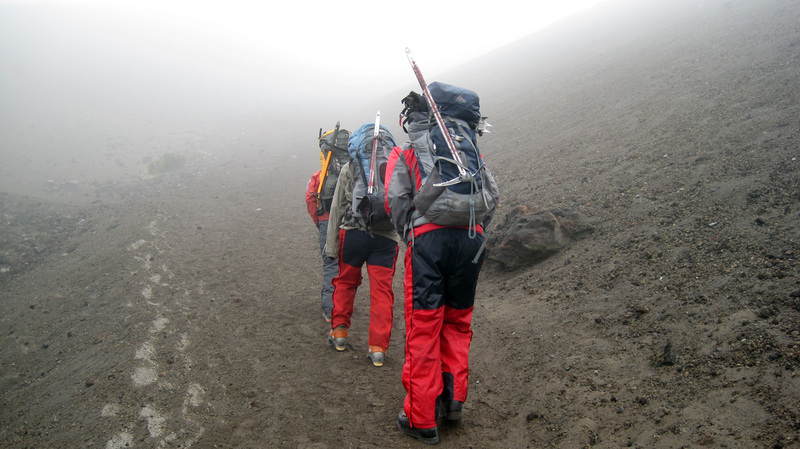 Starting up from the parking lot of Cotopaxi in the clouds, wind and rain. Jake and Caro settling into our space in the refugio. Some hot soup to warm us up that evening. 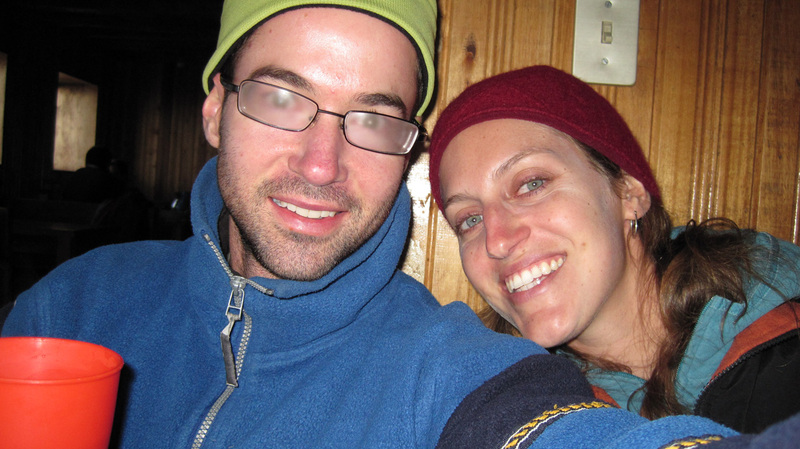 Foggy glasses and rented fleece, we had no idea what we were getting ourselves into. After a few hours of trying to sleep Marco woke us up at midnight. 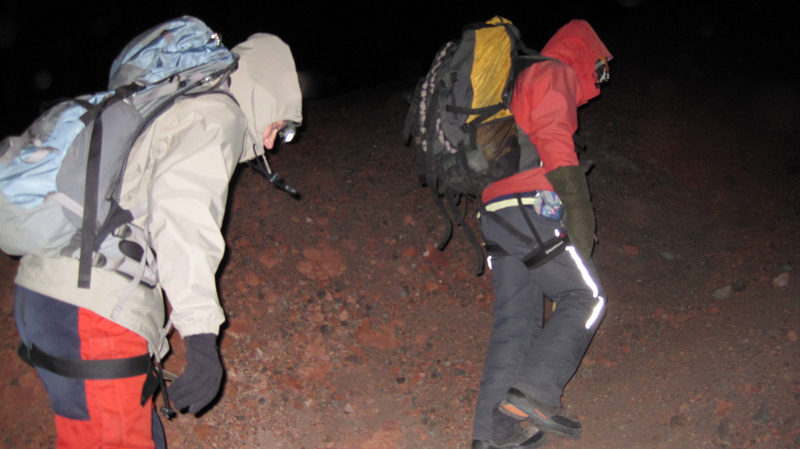 We put on many layers (four on the legs and four on top) and turned on the headlamps for the long climb up at 1am. We could hear the wind howling outside the refuge around midnight and it only got worse on the ascent. It took about an hour to cover the rocky trail to the start of the glacier, but most of that was semi-protected from the wind. It was a clear night and there was no moon, so the stars were incredibly bright and beautiful. It felt great to be back on a big mountain again and I was loving it. Caroline was slightly less keen to be out in the freezing cold and wind at one in the morning – she was focusing intently on the challenge ahead. Once we hit the glacier though, things got tough. We roped up with Marco in the lead, Caro in the middle, and me bringing up the rear. The first bit of ice (~100ft) was very rotten and steep, so we were not feeling super confident about the rest of the climb. Bare in mind this was Caroline’s first time in crampons and she was scaling a steep sketchy slope in the dark at about 17,000ft! Very impressive. Once that section was finished the ice turned to snow, the grip got much better and the route slightly less steep. Unfortunately, at this point the wind really picked up and was beating us back as we tried to climb up. This went on for about four more hours! At one point a hail storm engulfed us and we had to literally crawl to avoid being pelted in the face by marble sized ice bullets, it was nuts. 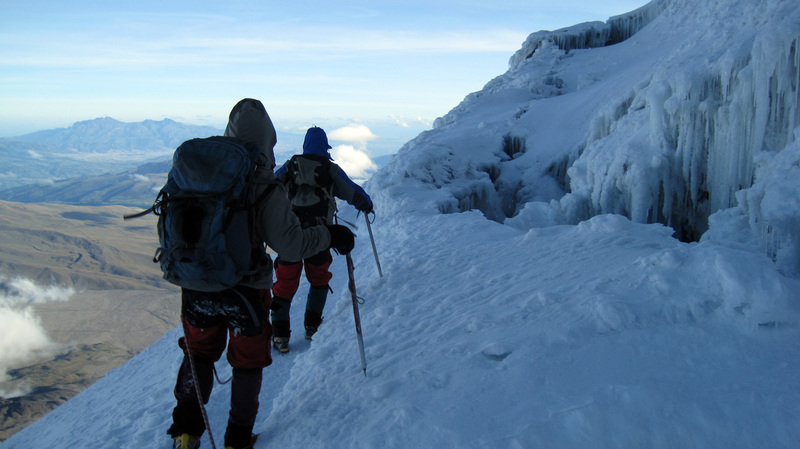 There were a few times when we almost turned back, but we had expended so much energy by this point and were so close to the summit that we decided to push on. Glad we did, because once the sun started to come up we felt a little better and could see that the summit was in reach. Cotopaxi had other ideas. As we neared the summit, about the last 200ft to the top, the wind slammed us. The headwind must have been over 60mph (at least the ice bullets were gone) and we barely made it over the crest to the rim of the crater. Once there we made our way to the actual summit and celebrated with hugs and high fives and a few tears. It was by far the hardest climb I’ve ever been on, and Caroline’s first! At least everything from this point on will be pretty easy for her. We started up on the rocky trail from the refugio at 1am and hit the glacier about an hour later. Summit! We made it up just after sunrise at 6:30am after a really tough climb in the dark. 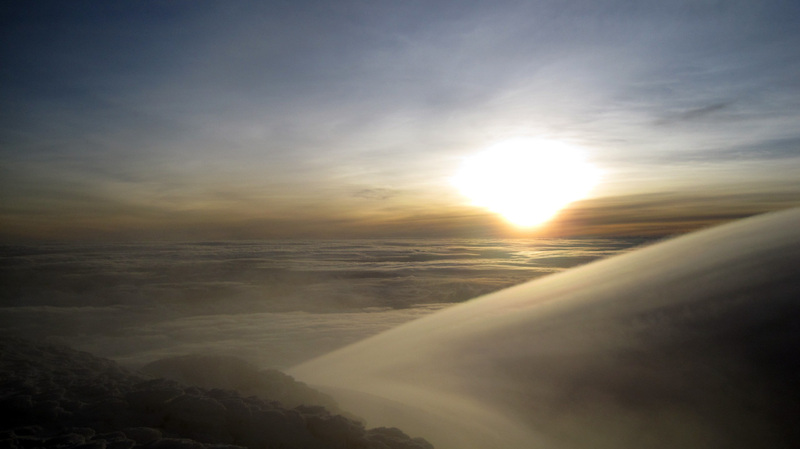 High speed clouds whipping over the crater. Winds were reported to be at 60mph here. Felt like 100! The sun pops up on February 18th. The shadow of the mountain just after sunrise. Marco took our camera and got some great shots of us on the way down. 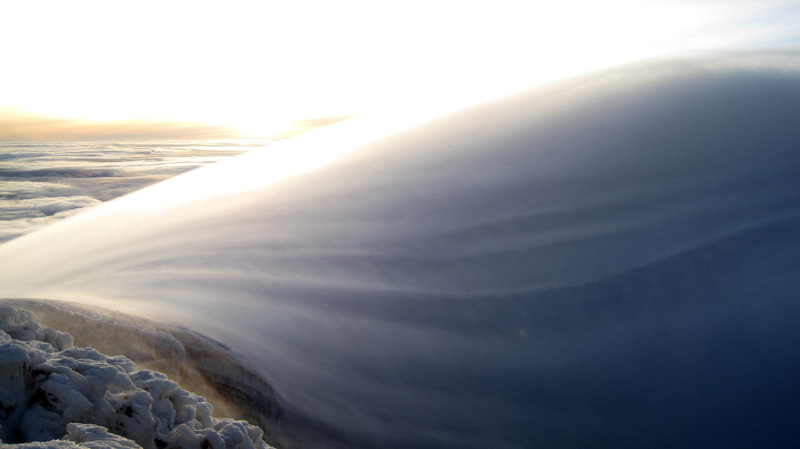 Wind turns the snow and ice into wild shapes near the summit. The volcano Antasana is visible in the background. The steepness of the slope is clear in this shot. No fall zone. Power breathing the whole way up and down was necessary as the air was very thin. Don't look down! 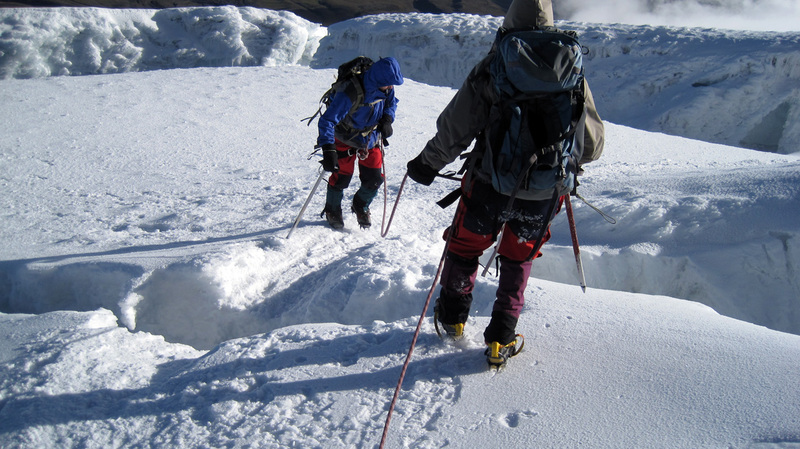 There were a few crevasses we had to hop over, but nothing too wide. Basking in the sunshine at last. One at a time over the snow bridges. We were so relieved to get down off the glacier, it was about nine hours round trip and we were spent. We still had another 45 minutes of slips and slides down the loose rock to the refuge. Our guide Marco led us well and took the photos of us on the way down. Thank you Marco! Next stop Buenos Aires! Uhh, make that Lima. Your photos are superb! Looks like the new camera is just fine. So good to see you in person on skype. Glad you’re warm and strong and happy! amazing! you are both so inspiring. 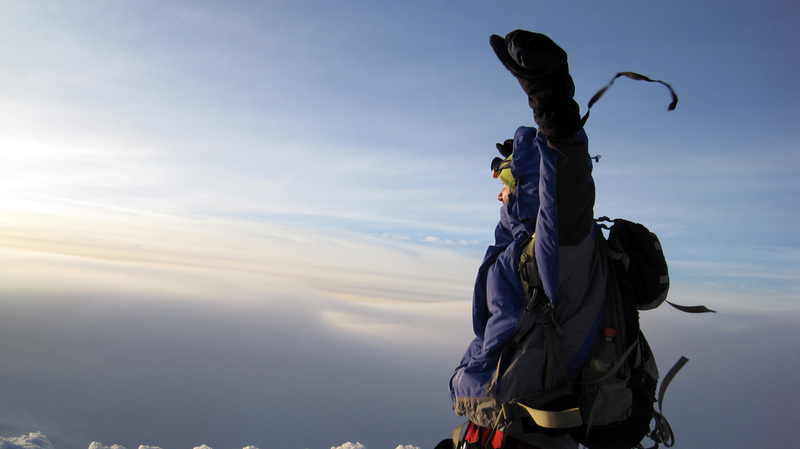 Great job Caroline – what an incredible first big climb for you! wow! miss you guys! OMG I can’t believe you two did that climb! I got scared just reading your account of it!! 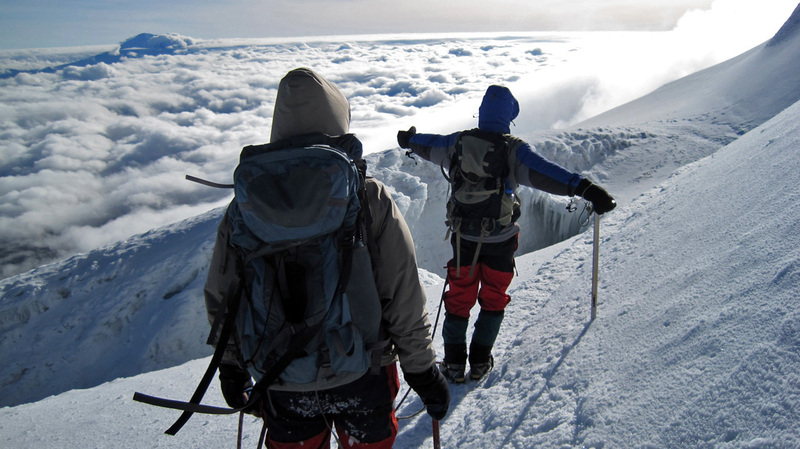 Wow…Amazing first climb! Thanks for the pictures Pat – wish I was there! Did you feel the quake where you are? Pat: I can’t wait to read the comments about B.A. Buena suerte con los portenos. Your first big mountain is a biggie.